What was Uncle Tom's Cabin? The novel called "Uncle Tom's Cabin" is a highly effective story containing powerful anti-slavery sentiments written by Harriet Beecher Stowe. "Uncle Tom's Cabin" was first serialized in a weekly abolitionist paper called 'The National Era' and published as a novel in 1852. 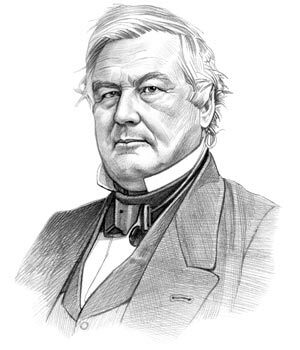 Millard Fillmore was the 13th American President who served in office from July 9, 1850 to March 4, 1853. One of the important events during his presidency was the publication of Uncle Tom's Cabin by Harriet Beecher Stowe. Uncle Tom's Cabin was an anti-slavery novel written by Harriet Beecher Stowe. The original title was 'Life Among the Lowly'. When did Harriet Beecher Stowe write Uncle Tom's Cabin? Uncle Tom's Cabin was by Harriet Beecher Stowe between 1850-1852. Uncle Tom’s Cabin was developed from June 1851 to April 1852 as a series of regular installments in a Washington, DC, abolitionist weekly paper called The National Era, whose editor was Gamaliel Bailey. Uncle Tom’s Cabin was then published as a two volume novel by John P. Jewett and Company of Cleveland Ohio on March 20, 1852. The book became a best seller and the story of Uncle Tom's Cabin was dramatization by G. L. Aiken and the play was staged at the National Theatre in the summer of 1853. Anti-slavery propaganda by journalists, authors and illustrators was one of the methods used by the 1830 Abolitionist Movement who wanted to abolish slavery. The Underground Railroad had been established in1832 to provided money, clothes, transport and safe houses to facilitate the escape of slaves from their harsh lives of unpaid toil in the southern plantations. Why did Harriet Beecher Stowe write Uncle Tom's Cabin? Harriet Beecher Stowe wrote Uncle Tom's Cabin following the passing of a more stringent Fugitive Slave Act in 1850. The 1850 Fugitive Slave Act was passed on September 18, 1850, was part of the Compromise of 1850 and included as a concession to the South, increasing penalties against fugitive slaves and the people who helped them. The penalties for helping slaves were increased to $1000 and six months in jail. Who are the Main Characters in Uncle Tom's Cabin? A short summary and overview of "Uncle Tom's Cabin" are detailed via Uncle Tom's Cabin Summary. Who are the main characters in Uncle Tom's Cabin? The main characters who feature in "Uncle Tom's Cabin" are Uncle Tom (slave), Simon Legree (vicious slave owner), Eva St. Clare (angelic white girl), Miss Ophelia (bigoted white woman), Arthur Shelby (kindly slave owner), George Shelby (Abolitionist), Augustine St. Clare (kind slave owner), Topsy (slave), Cassy (slave) and Eliza (slave). Harriet Beecher Stowe also provides and example of the 'Hiring-out system' in which Tom's wife goes to work for a baker in order to raise the money to buy Uncle Tom back. The illustrator of Uncle Tom's Cabin was Hammatt Billings (1818–1874). The picture of the engraving features a scene from the book and shows the characters of Eliza, Harry, Chloe, Uncle Tom, and Old Bruno. Hammatt Billings was a member of the Abolitionist Movement and had produced pictures in 1850 for the famous William Lloyd Garrison’s abolitionist newspaper, The Liberator producing scenes using antislavery iconography to portray the lives of slaves, the slave trade and the slave auctions. His most famous work were the line drawings used to illustrate Uncle Tom's Cabin. 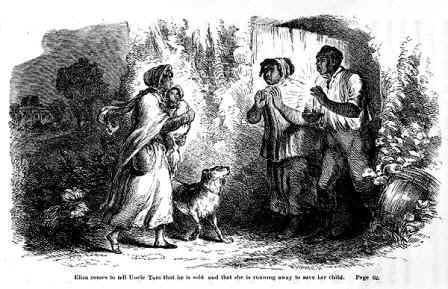 The Illustrations used in Uncle Tom's Cabin were extremely important, inspiring and helping readers to visualize the horrors of slavery. The pictures not only contained antislavery iconography but also contained religious iconography and religious symbolism. The Second Great Awakening was a was a Christian revivalist movement that sparked zealous social reformation such as the Anti-Slavery Abolitionist movement. The social pressure groups sought to awaken the consciences of people to reform society which included supporting the rights for women. The rights of women are also alluded to in Uncle Tom's Cabin. Harriet Beecher Stowe was a social reformer who advocated the rights of slaves and believed in the rights of women. She was also extremely religious and the ideals of the Christian faith are reflected by her evangelical fervor in the story of Uncle Tom's Cabin. Harriet Beecher Stowe was a gifted writer and readers of her work were moved to tears by the tales of cruelty towards the characters who were featured in "Uncle Tom's Cabin" and the impact of slavery on families. However, the book was balanced and it presented some of the favorable aspects of slavery and the kindness of some slave owners, but it also crystallized the sentiments of the North. Uncle Tom's Cabin and the Fugitive Slave Law convinced the people of the North that bounds must be set to the extension of slavery and contributed to the Causes of the Civil War. 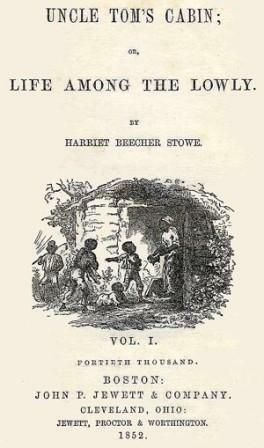 The informal, conversational writing style adopted by Harriet Beecher Stowe in Uncle Tom's Cabin personalized the political and economic arguments about slavery and enabled readers to emphasize with the plight of the slave characters. Uncle Tom's Cabin by Harriet Beecher Stowe contributed to the outbreak of the American Civil war (1861-1865) but also changed opinions towards slavery throughout the world. President Abraham Lincoln is reported to have greeted Harriet Beecher Stowe ten years after the publication of "Uncle Tom's Cabin" saying "So you're the little woman who wrote the book that made this great war." The book of Uncle Tom's Cabin was translated into sixty different languages and is still read in college and high schools exploring the history and issues of race, religion and gender. The article on Uncle Tom's Cabin provides an overview of one of the Important events of his presidential term in office. The following Millard Fillmore video will give you additional important facts and dates about the political events experienced by the 13th American President whose presidency spanned from July 9, 1850 to March 4, 1853.